This is the cover for the current issue of Wired magazine. 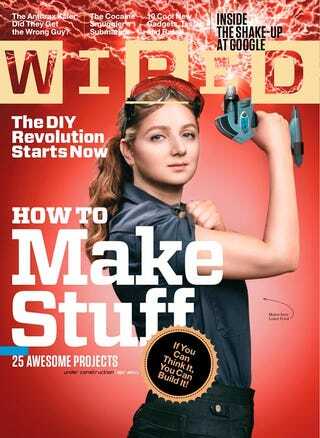 The woman on the cover isn't just a model in the traditional sense: She's Limor Fried of Adafruit Industries, and very possibly the first woman engineer to grace the cover of Wired. And she looks good on it. So, some people freaked out. Wired didn't put Limor Fried on their new cover. What Fried actually looks like is below—she's a normal young woman with a lip ring and an abnormally strong brain, and that's worked wonders for her her entire life. What Wired put on its cover is an almost cartoonish Photoshop that caused one friend to look at these photos next to each other and ask, "That's the same woman?" But, more interesting is what it says about the ways ultra-smart woman are perceived. What's implicit in Good's outrage is the assumption that Fried, badass engineer and genius, couldn't have possibly been as attractive as she appears on Wired's cover. The underlying message is that there has to be a distance between brains and beauty. Consider any article that marvels over the fact that Natalie Portman isn't just an attractive celebrity, she's like, smart. The general cultural narrative for attractive women who are recognizably intelligent is almost always one of surprise, one way or another—it's shocking that an attractive woman is intelligent, or that an intelligent woman is attractive.